At Right To Ride we have read through ‘many’ diverse articles about and associated with motorcycles, some which would drive you to drink! However it is a pleasure to have read through such an interesting, short and to the point article that was sent to us entitled “The Traditional Cast Iron Manhole Cover”. Cast Iron has been used to manufacture many items down the ages from cookware, stoves, gratings, gates, railings, palings to bridges and much more. For motorcyclists, the most well know form of the use of Cast Iron is the traditional Cast Iron Manhole cover or service cover. Motorcyclists have had a hate relationship with these covers, ever since the motorcycle hit the road (pun) and a Cast Iron Manhole cover was first used. As the article points out, there have been efforts to combat the risk that worn out covers can present. There has been anti-slip material applied and efforts to replace cast iron with other materials as well as skid resistance standards amended with acceptable in-service skid/slip resistance. However onto the article which has been sent to us by Richard Holladay. 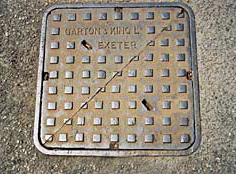 Richard came across Right To Ride as he was trying to establish the wear qualities of ductile Cast Iron and has written a history of Garton & King and its predecessors whose Cast Iron products, “litter the highways and byeways of the westcountry” and who can trace their trading history back to 1661 within the historic city of Exeter in Devon, England. This does little to diminish their strength but the term Worn Out would apply and it is indeed interesting to see that there are products and methods being introduced to combat the risk that a Worn Out cover presents to any wheeled vehicle, particularly to, presumably anybody on 2 wheels – powered or not. 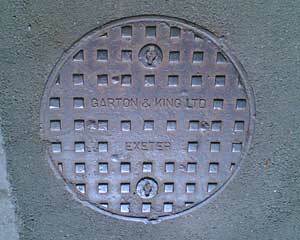 In my part of the world, the family business cast hundreds of thousands of cast iron inspection and manhole covers from the 1900 to 1980 (www.exeterfoundry.org.uk) and they litter the highways and byeways of the westcountry, particularly Devon and specifically the Exeter Area.